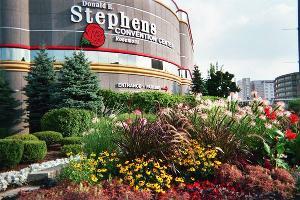 The Donald E. Stephens Convention Center is located at 5555 North River Rd. in Rosemont, just south of the Kennedy Expressway and east of Chicago O'Hare International Airport and the Tri-State Tollway. Parking is across from the Center, on Williams Street, directly behind the Embassy Suites Hotel. Garage parking is $13. Exit at O'Hare (1-190 West), pay toll, exit Mannheim Rd. south. Proceed in right line, re-enter east to Chicago 1-190, proceed 1 mile, exit River Rd. south. Convention Center is on the left. Exit at Balmoral, pay toll. Turn right. Next light turn left on to River Rd. For public parking turn left on the first street- Williams Street and proceed into the parking garage. Exit O’Hare/River Rd. (1-190 West), pay toll. Exit left after toll plaza to River Rd. Turn right at River Rd. Convention Center is approximately 3 blocks on the left. Exit O'Hare (1-190 West), exit River Rd., turn right at River Rd. Convention Center is approximately 2 blocks on the left. Proceed east to Chicago on 1-190. Exit at River Rd. south. Convention Center is approximately 1 block on the left. Balmoral Ave. west to Mannheim Rd. north to 1-190 east to Chicago. One-half mile to 294 north to Wisconsin. River Rd. south to Balmoral (Rosemont Theatre), turn right (west) to 294 south. Please contact the hotel directly to reserve your overnight room at the discounted room rate of $159 per night plus taxes. Please refer to the ONX Conference to receive the discount rate. Please note that this rate includes complimentary wifi in your guest room for our conference attendees. Rooms are limited so please book as soon as possible. Click here to book your reservation online at the Hyatt Regency. The cut-off date for the group rate has expired so please contact the hotel directly and ask for the best rate available or you may book online using the link below. Click here to book your reservation online at the Embassy Suites.